It's the 1st October so all bets are off - I have no qualms about mentioning the 'C' word! 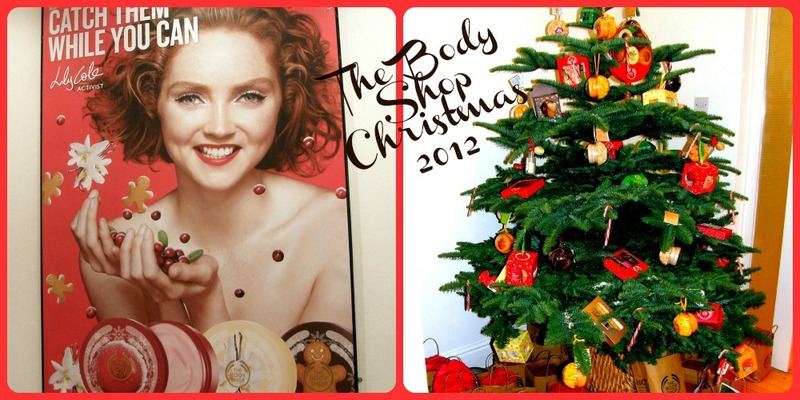 Christmas came early to a room above Grafton Street last Thursday as The Body Shop unveiled the goodies they have in store for us this Christmas. The Body Shop has always been a fail safe stop on the Christmas pressie shopping circuit for many people, but this year they seem to have such an abundance of really lovely stuff. They have some gorgeous special edition Christmassy products and have dressed up old favourites in festive packaging. There's luxurious gift sets and cute stocking fillers. The term 'something for everyone' comes to mind. The Christmas Special Edition bath, body and home products are available in three different scents - Cranberry Joy, Vanilla Bliss and Ginger Sparkle. Ginger Sparkle is my favourite - I LOVE anything gingery and cinnamonny and nutmeggy so if you're anything like me, you'll love this too. The scents are available in loads of products, from body butters (€18.95) and lip balms (€8.50) (it's a dome lip balm, fans of EOS balms) to home fragrance oil (€6.95) and hand wash (€9.95). Chocomania Shower, Scrub and Moisture Set €25. Love the reusable heart shaped tin. Limited Edition Vanilla Bliss and Ginger Sparkle products. Prices range from €3.95 for a soap bar to €22 for bath crystals. Ginger Sparkle Body Butters €18.95. Love the cute packaging! Vanilla Bliss Body Butters €18.95. Mountain Rose Soften and Spritz Gift in book style packaging €29.95. Born Lippy Fruity Lip Balms €17. This is also available in a larger lolly with mini body butters (just seen on the left of the photo) for €25.50. Launching on the 23rd October is The Body Shop's Winter Trend Make-Up range which is a collection of mainly neutral toned products which is right up my street. Dazzling Rocks* €28.95. These give a gorgeous sheen to the decolletage. The Sparkler* (€23.95) also makes a return this year. I love this - so glam! It basically sprays a very fine glitter dust all over you. Be careful, though, not to pump it repeatedly when the stopper is on, and then take the stopper off... because then it literally sprays glitter dust all over you and everyone and everything in your vicinity. We speak from (a very mortifying) experience. Let's just say you can't take us anywhere. On Thursday we had the opportunity to speak to Milan Dev Bhattarai who is one of The Body Shop's Community Fair Trade Suppliers from Get Paper Industries in Nepal. His company design and supply packaging to The Body Shop and use some of their profits to support education in the local community. They help fund seven schools in the area and have funded a 'Send our Daughters to School' campaign (over 60% of girls in Nepal receive little or no education). They also employ more than 300 women and pay them the same wage as men, a rarity in Nepal where there is widespread subordination of women. You often hear about The Body Shop and their ethical business practices but it was really interesting to meet someone who is directly involved.